Equip your home with Samsung Digital Appliances for a Happy Summer After. There are many different reasons to love a family staycation this summer. It’s an incredibly easy and convenient way to spend time, have fun, and unwind with your loved ones. No need to take long-distance trips away from home, go through the trouble of packing, or worry about who’s going to look after the house while you’re away. If you think about it, staying in can be one of the best ways to take a break this season. And to make this time all the more fun and memorable, why not equip your home with reliable homemaking partners like Samsung Digital Appliances? They’re equipped with innovative features that promise to help you provide the best care for your family. From April 1 to June 30, 2018, you can purchase these state-of-the-art appliances at up to 20% off. Just head to any authorized Samsung dealer and look for Samsung Digital Appliances’ Happy Summer After deals. Keeping your family comfortable and happy despite the heat has never been as easy as the Samsung Wind-Free™ Air Conditioner. Make blanket forts, or build that dollhouse because your kids can now stay cool at home and won’t ever want to leave. It’s built with 21,000 micro air holes that gently and evenly disperse cold air, therefore avoiding the unpleasant feeling of direct air blow. Apart from that, it’s equipped with a digital inverter technology, which consumes only 32% of the energy used by conventional air conditioners. This way you can stay cool throughout the season without worrying about the electric bill. You might expect heavier loads of laundry this season as your family faces excessive sweating and exposure to all sorts of dirt from outdoor activities. No need to worry, though. You can power through it all and keep your loved ones feeling fresh and clean every day with the Samsung FlexWash. It’s built with two washers and one dryer, enabling you to run two different loads at the same time. It’s also equipped with an AddWash door, which allows you to easily pop in any forgotten garments or more delicate fabrics mid-cycle. There’s nothing more invigorating than a serving of fresh fruits and vegetables on a warm day. Be a kitchen wizard as you make ice cream, waffle, or yogurt with the help of the Samsung Twin Cooling Refrigerator. You can stock up on and serve your loved ones their favorite produce for weeks on end. It’s equipped with two separate evaporators that provide and maintain optimal humidity levels in the fridge, keeping stored food fresh and tasty for up to two times longer. Make the most of your free time this season by concocting healthy and delicious meals with your kids at home. The Samsung Smart Oven functions as both a grill and microwave, so you can quickly whip up delicious and healthy meals. Apart from that, the appliance is designed with the Hot Blast™ technology, which blows powerful hot air through multiple air holes to keep your food crispy on the outside, juicy on the inside. You can also enjoy fried food guilt-free with its Slim Fry technology, automatically frying food that is crisp on the outside and flavorful inside, with no additional oil. Create an effortlessly Happy Summer After for the whole family with these innovative home partners. 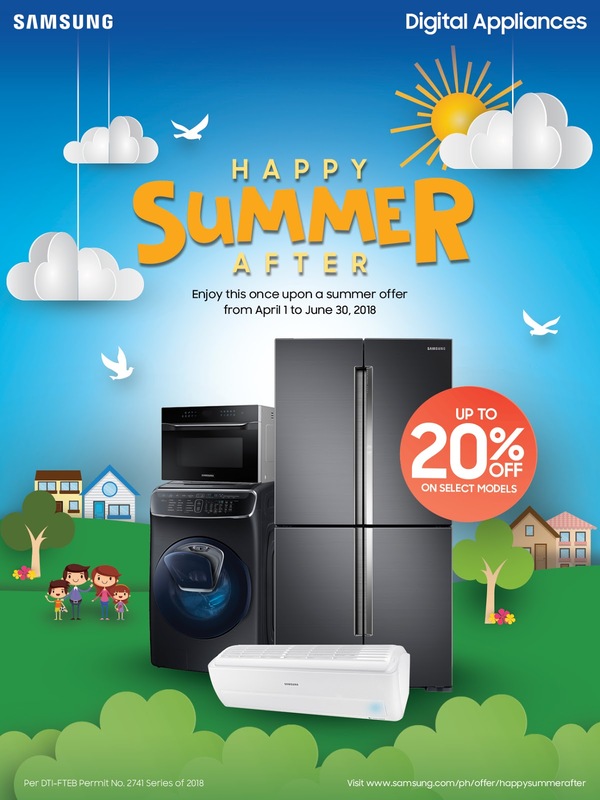 Don’t miss the chance to avail of these great deals from Samsung Digital Appliances from April 1 until June 30, 2018, and make this the best summer yet for your family. Head to the nearest Samsung authorized dealer or visit http://www.samsung.com/ph/offer/happysummerafter for more information. Samsung inspires the world and shapes the future with transformative ideas and technologies. The company is redefining the worlds of TVs, smartphones, wearable devices, tablets, digital appliances, network systems, and memory, system LSI, foundry and LED solutions. For the latest news, please visit the Samsung Newsroom at news.samsung.com.